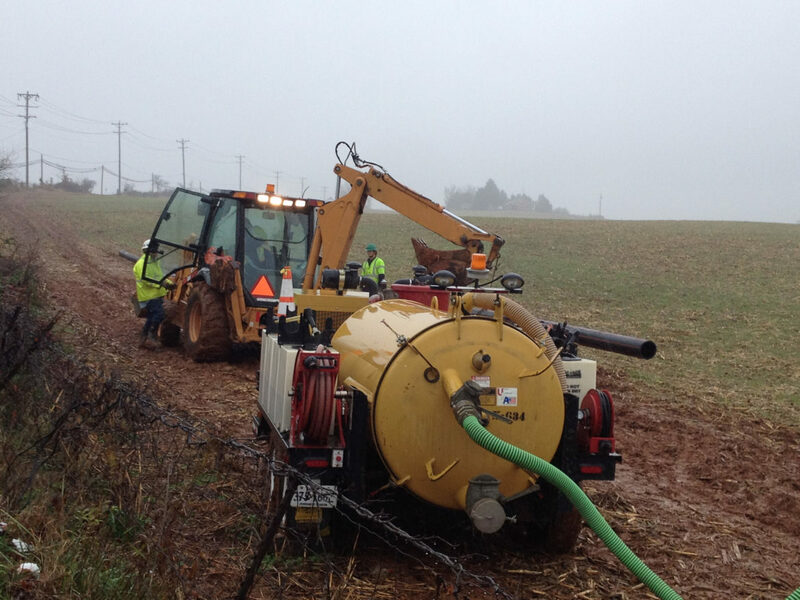 Construction crews bury a transmission line in Frederick County in Maryland. While proposed long-distance, high-voltage transmission projects continue to be stymied by hostile landowners and disapproving state regulators, a new transmission strategy is taking root in the Midwest. The Direct Connect Development Company has been working on a plan for an underground transmission line along existing railroad tracks from north-central Iowa to the Chicago area. The goal is to provide a way to move additional wind energy from Iowa, the Dakotas and Minnesota to a transfer point in the Chicago area. From there, the power could move farther east into regions with more electricity demand. And because the line with a capacity of 2,100 megawatts (MW) would be mostly invisible, it might elude some of the problems that have dogged transmission lines that would tower overhead while crossing Midwestern farm fields. Direct Connect CEO Trey Ward said the Canadian Pacific Railway has agreed to allow the comany to bury the line within its right of way, which extends for about 85 percent of the 349-mile route. Ward said he’s following the example of the nation’s fiber optic network, which also made use of railroad rights of way. SOO Green Renewable Rail LLC, as the project is known, could challenge the Rock Island Clean Line, a proposed overhead transmission line that would move about 3,500 MW of wind energy from northwest Iowa to the Illinois-Indiana border — a roughly similar route to the Green Renewable Rail plan. For several years now, Clean Line Energy Partners has been attempting to get permission from Iowa and Illinois regulators to build the Rock Island line. In September, the Illinois Supreme Court ruled that Clean Line had not fulfilled one of the requirements for a permit to build the line in Illinois. While it seeks a solution to that, the company has withdrawn the application it had pending before the Iowa Utilities Board. Clean Line declined to comment on Ward’s vision for an apparently competing transmission line. Clean Line is also attempting to build the Grain Belt Express project, a 780-mile transmission line out of Kansas to Missouri, Illinois and Indiana. Missouri regulators had denied the plan, though the developers — led by former Gov. Jay Nixon — are challenging the decision. Ward is optimistic that he won’t encounter the same regulatory obstacles that Clean Line has. He said he has spoken with utility regulators in both Iowa and Illinois. Ward is aiming to begin construction by early 2020 and to be operational by early 2024. He is trying to raise about $90 million in capital. The project’s price is estimated at $2.5 billion to $3 billion. Even if Ward has 85 percent of the route wrapped up, that leaves another 15 percent that could cause him some trouble. Ward claims he’s confident he can pull it all together. As a result of recently completed multi-value transmission projects across the region, he said, his project would be able to tap into a wide swath of the windiest land this side of Canada. The German manufacturing conglomerate Siemens, looking for a way to unobtrusively move wind power from the North Sea to southern Germany, has been “leading the charge,” Ward said. The company has used a new rubber-based cable that is “very easy to handle in the field, easy to splice,” Ward said. High voltages of power moved underground now require “a relatively small footprint,” about two-and-half feet across, Ward said. Two transmission cables are installed about three to five feet underground. It seems that the price has a smaller footprint as well. And although underground installation generally adds to construction costs, Ward said he’s confident that the invisibility of this approach will reduce opposition, legal bills and permitting costs enough to compensate for much of the cost of digging a 349-mile-long trench.